The Creation may be perceived as a ‘Real-Idea’ that arises in the Supermind- a totipotent Idea full of Force so that it is executed into action and aligned perfectly, but it needs a field--a matrix to manifest. That field is provided by time and space. We have examined that it is the same pure Conscious-Force that gets constituted into Space and Time. 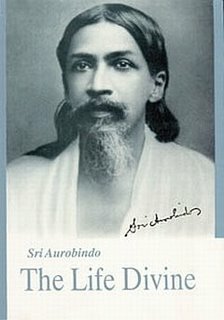 One could therefore emphatically say that Space and Time are ‘THE FUNDAMENTAL DUAL DIMENSIONS OF THE BRAHMAN’(Sri Aurobindo in Evening Talks with Sri Aurobindo, Rec. by A.B.Purani, 3rd ED, 1982, Pondicherry; Sri Aurobindo Ashram, pg.83). (a)	Time is measured by mobility, by succession of past, present and future where Mind places itself at a certain point and looks before and after. It is interesting to note that the brain can actually perceive certain events even before they have occurred. Consciousness researchers are trying to understand the neurophysiology of this process and what they have surmised is yet an assumption. As they cannot yet understand the neurodynamics of this process, they are focusing on ‘who’ perceives the process in the brain. That also is difficult to surmise unless we accept that there is a BEING behind who is and also applies the Conscious-Force that gets formulated into Time and Space. (a) Spatial Reality is not a homogenous entity. Space is needed for forms to manifest in the creation. As there are a variety of forms in the manifestation, there must be too a variegated array of spaces. We have physical spaces occupied by physical forms and we have too non-physical spaces occupied by nonphysical formations like emotions, ideas, and the self ’or‘pure consciousness. Moreover, SPACE in a global sense expands and contracts to maintain a vibrant, pulsating universe. This ‘variable’ status of ‘SPACE’ results in its complex interaction with ‘TIME’. A simple illustration will show how complex is the relation between spatial and temporal realities. A child occupies a certain physical space. When he grows up to be a young man, his physical space enlarges. When he gets old and shrinks, his physical space diminishes. This expansion and contraction of physical space is something we observe in the background of a linear time perspective. However the emotions, ideas, memory of this person also occupy non-physical spaces. That non-physical space may not necessarily correlate with a linear temporal perspective. Suppose the person is a genius with a calendar memory- he can correctly say the date and time without consulting a calendar spanning a period of 20 years forwards and backwards- how can one relate the mental space of such a person with our usual notion of linear time! (ii) The superconscious, which exerts a pull on us to progress in consciousness and often prepares in advance that for which we aspire. Such a circular notion of Time, simultaneously holding the past, present, and future must have a complex interaction with Space which has both physical and non-physical dimensions. (b) At the level of the ‘apprehending’ Supermind, the idea that ‘space’ and ‘time’ have to be formulated as two distinct dimensions of the same Conscious-Force so that creation can have a field to manifest becomes explicit. In fact, each created form gets a support at this level – the decree to manifest. Below the level of the Supermind but above the level of the ordinary sensory perception, there is then born the ‘subtle form’, which supports the manifestation of the ‘gross form’ in creation. At the level of the ordinary mind, space and time become delinked from each other. Unless one reconstructs their relation at the level of the Supermind, they cannot be reconciled and integrated. ‘That which is an apparent discord to the mind because it considers each thing separately in itself, is an element of the general ever-present and ever-developing harmony to the supermind because it views all things in a multiple unity. Besides, the mind sees only a given time and space and views many possibilities pell-mell as all more or less realizable in that time and space; the divine Supermind sees the whole extension of Time and Space and can embrace all the mind’s possibilities and very many more not visible to the mind, but without any error, groping or confusion; for it perceives each potentiality in its proper force, essential necessity, right relation to the others and the time, place and circumstance both of its gradual and its ultimate realisation. To see things steadily and see them whole is not possible to the mind; but it is the very nature of the transcendent Supermind. ‘The supermind in its conscious vision not only contains all the forms of itself which its conscious force creates, but it pervades them as an indwelling Presence and a self-revealing Light. It is present, even though concealed, in every form and force of the universe; it is that Ibvariations it compels; it gathers, disperses, modifies the energy which it uses; and all this is done in accord with the first laws that its self-knowledge has fixed in the very birth of the form, at the very starting-point of the force. It is seated within everything as the Lord in the heart of all existences,- he who turns them as on an engine by the power of his Maya; it is within them and embraces them as the divine Seer who variously disposed and ordained objects, each rightly according to the thing that it is, from years sempiternal.’ (Ibid, pg146-147).